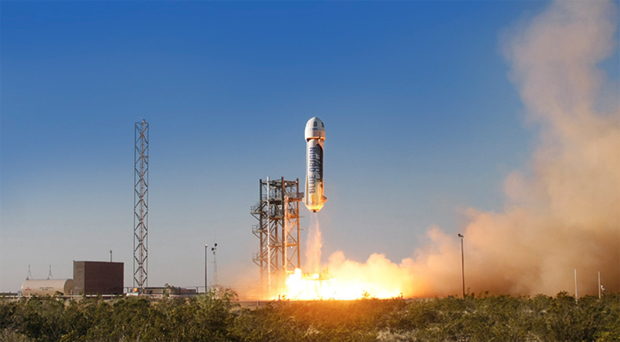 Blue Origin, a rocket engine and spacecraft development company owned by Amazon-founder Jeff Bezos, carried out an unpiloted maiden test flight of its New Shepard sub-orbital launch vehicle Wednesday, the company revealed early Thursday. A dramatic video posted on Blue Origin's website (https://www.blueorigin.com/) showed the squat vertical-takeoff-and-landing New Shepard rocket being erected on a launch platform at the company's west Texas development facility followed by a brief countdown -- with Bezos looking on -- a smooth liftoff and a vertical climb to an altitude of 58 miles. At that point, the dummy crew capsule separated from its booster and completed a parachute descent to Earth. 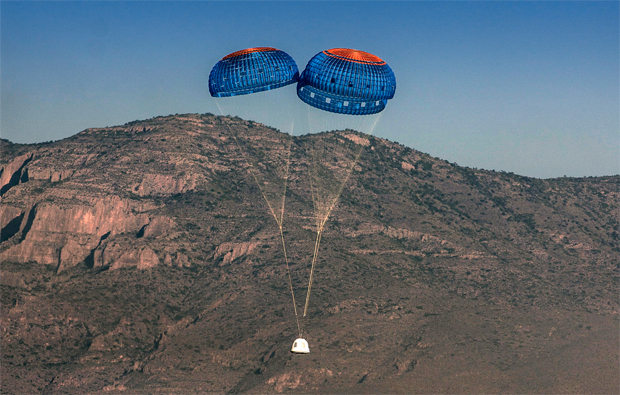 "Today we flew the first developmental test flight of our New Shepard space vehicle," Bezos said in a web posting. "Our 110,000-lbf thrust liquid hydrogen, liquid oxygen BE-3 engine worked flawlessly, powering New Shepard through Mach 3 to its planned test altitude of 307,000 feet. "Guidance, navigation and control was nominal throughout max Q (maximum aerodynamic pressure) and all of ascent," he wrote. "The in-space separation of the crew capsule from the propulsion module was perfect. Any astronauts on board would have had a very nice journey into space and a smooth return." The New Shepard is intended to be a fully reusable sub-orbital spacecraft with the booster flying itself to a vertical, rocket-powered landing after separation from the crew capsule. That phase of the test flight Wednesday was not successful, and the video did not include any shots of its descent. "One of our goals is reusability, and unfortunately we didn’t get to recover the propulsion module because we lost pressure in our hydraulic system on descent," Bezos wrote. "Fortunately, we’ve already been in work for some time on an improved hydraulic system. Also, assembly of propulsion module serial numbers 2 and 3 is already underway -- we’ll be ready to fly again soon. The New Shepard vehicle is built around the company's hydrogen-fueled BE-3 engine, which can be throttled through a wide range of power settings. The booster is designed to propel a crew/cargo capsule to altitudes above 62 miles, the generally accepted boundary of space. The capsule then separates for four to five minutes of weightlessness before falling back into the discernible atmosphere for a parachute descent. "New Shepard is designed to carry three or more astronauts up to sub-orbital space," Blue Origin President Rob Meyerson told reporters earlier this month. "We say 'three or more' because there are combinations of astronauts and science payloads. We believe the science payload market is going to be a big one as well." Blue Origin will be competing with Richard Branson's Virgin Galactic, with its winged air-dropped rocketplane, and other companies vying to carry "space tourists" out of Earth's atmosphere for brief sub-orbital forays into space. "We continue to be big fans of the vertical takeoff, vertical landing architecture," Bezos said. "We chose VTVL because it’s scalable to very large size. We’re already designing New Shepard’s sibling, her Very Big Brother -- an orbital launch vehicle that is many times New Shepard’s size and is powered by our 550,000-lbf thrust liquefied natural gas, liquid oxygen BE-4 engine." The BE-4 has been selected by United Launch Alliance, a partnership between Boeing and Lockheed Martin, to power the company's new Vulcan rocket, the successor to the Atlas 5 and Delta 4 families of boosters.